The summer vacation has long been an American tradition, but not all destinations are created equal. While the 1% are off on their luxurious destination vacations, for many Americans who continue to see their income decline, the prospect of an end of summer vacation dims along with it. The continuing economic slump has meant another summer of staycations for many middle class Americans. 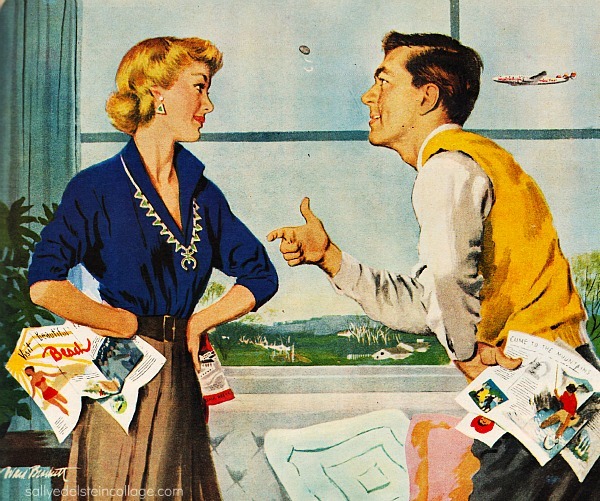 So what’s a struggling family to do for fun this summer? What if you could experience the thrilling wonders of Yosemite, the cool mountains of the Alps, the majesty of the Grand Canyon along with hundreds of other thrilling locations, teeming with adventure and beauty all from the comfort of your living room couch. 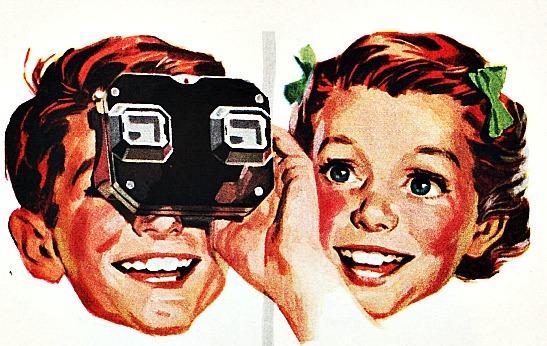 If you’re the happy owner of a genuine View-Master, the world’s your oyster… at least it could be if this was the 1950s. and ‘60s. 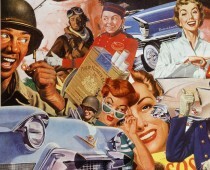 The View-Masters enthusiastic ads promised the stay-at-home-vacationer a travel experience like you never encountered. It was down right thrilling! “You’ll thrill to marvelous views with View-Masters famous 3D view,” the ads gushed. 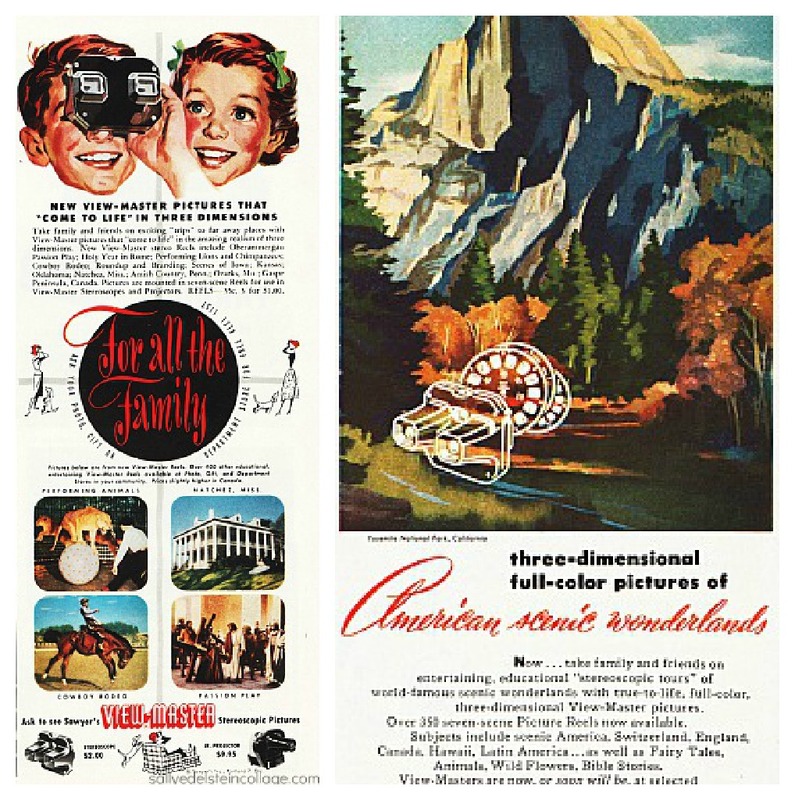 The ads further promised to “take family and friends on entertaining educational stereoscopic tours of the world famous wonderland with true to life color 3 D view master pictures”. Whether to seashore, the mountains or a historical site they would be your guide. Yes, you’ll smile with satisfaction at the money you save, you’ll smile with pleasure as you relax in your Laz-E-Boy recliner as you travel the globe. View-Master saved many a rainy day for me growing up in the 1960s. Stuck inside my home in a non air-conditioned house during a stormy summer, could be a recipe for disaster for a 6-year-old. While my older brother could be content to stay put with his transistor radio and lose himself in the top 40 world of “Music radio …77 WABC…the place to be…hit time of bop shoo op a bop bop”, I was the more restless spirit. After amusing myself with the hand- me- down Tinker Toys and Lincoln Logs, remnants from my brothers old Davy Crockett days, I developed a case of wanderlust. My brother may have been satisfied merely listening to Ricky Nelson croon on about being a travelin’ man…. I wanted to be one. Now with the help of my trusty View-Master I could travel to the farthest corner of the earth or at least Carlsbad Caverns, Muir Woods, or the Hoover Dam. If I never found out “who put the bomp in the bomp bah bomp bah bomp? Who put the ram in the rama lama ding dong? “it was fine by me. Seeing the world in vivid colorful 3D was almost like being there. Holding the black speckled Bakelite View-Master, I’d carefully insert the circular cardboard discs with the individual tiny picture windows into the top of the viewer, waiting to heart the click letting me know it was in its correct position. I was ready to be transported. The View-Master dangled the promise to take me on thrilling 3D adventure and it was true to its word. Whether down old Mexico way, or walking the sands of Waikiki, I would make a lot of stops all over the world. You’ll never even miss that costly destination vacation.